So we had some smoked pulled pork left over. No really, we had leftovers! One of my favorite things is carnitas tacos. Carnitas....pork. Smoked pulled pork.....pork. hmmmmm. a big gob of pulled pork in the skillet will let you get a nice krispy bite to the pork. 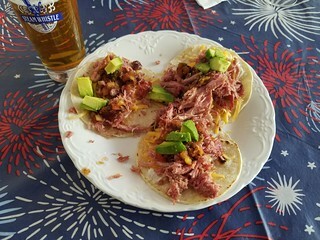 Next, street taco sized tortillas, some shredded cheese, a bit of pico, some avocado and there you have it... Redneck smoked pulled pork street tacos. Damn, they are good.